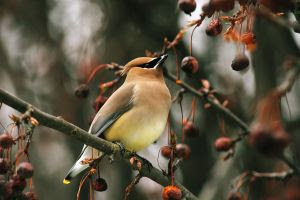 Wild Birds Unlimited: What birds eat apples? About 80 million years ago an early form of rose (a short, thorny plant with small, white, five-petaled flowers) was one of the earliest flowering plants to develop on earth. After many years several fruits evolved from this early rose. Apples, pears, plums, quinces, peaches, cherries, strawberries, raspberries and blackberries all belong to the Rose (Rosaceae) plant family. The apple was the result of the cross-pollination of an ancient plum and a plant we call meadowsweet, in the genus Spiraea. 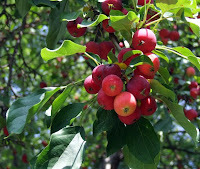 The crabapple is the only apple native to North America. The pilgrims planted the first United States edible apple orchard in the Massachusetts Bay Colony in the early 1600’s. Today Apples are grown in all 50 states. The top apple producing states are Michigan, Washington, New York, Pennsylvania, California and Virginia. American Robin, Blue Jay, Northern Bobwhite, Northern Cardinal, Cedar Waxwing, American Crow, Common Grackle, Downy Woodpecker, Eastern bluebird, Eastern Towhee, European Starling, grosbeaks, Gray catbird, Hairy woodpecker, House Finch, Northern Mockingbird, orioles, Purple Finch, Red-bellied woodpecker, Red-headed woodpecker, Ruby-throated Hummingbird, and Tufted Titmouse. Thank you for the information! I didn't know birds ate apples. Now that I think of it, it makes sense! Everyone of my wild birds seem to eat the apples EXCEPT the Chickadee and they're the ones who I prayed would come. HELP! All of them are spoiled to the black oil sunflower seed. The Chickadee look at the suet, try it then look to my window like "turncoat" then turn their own coats and fly away. I've smeared Peanut butter on the tree and they refuse it. What else can I give them that they'll eat? My squirrels are welcome; however, I throw the black oil seed WAY OUT for them. A few of them have resorted to the apples. Finances are tight, black oil seed cost $$$ and I don't know what to do. I have lots of chickadees in the winter and one reason may be all of my pine trees. They love the seeds in the pine cones and find shelter in dense branches. Take a nature walk to collect pinecones and string them up for the birds. Or look for acorns, walnuts, pecans, hazelnuts... Run them over with your car to crack them and offer them to the birds. I also have a little window feeder at work that I fill with no-mess blend (sunflower chips, peanut pieces, and millet without the shell). I fill that with about one pound of seed a week and it attracts lots of chickadees throughout the day. At home I have the seed cylinder and birdie bell feeders. The compact seed cakes last from about 2 weeks to 3 months depending on what size I put on the feeder. It attracts a lot of chickadees and titmice. We also have chickadee feeders that only the little birds can access if that is what you want. feb.23,2012,spread peanut butter and then roll in seed. i want jays but they don't come. i am wondering what fruit they eat. I have blue jays sometimes because. I feed the squirrels unshell peanuts on my balcony and when they leave some the blue Jay comes and gets them sometimes they be outside calling me to throw out some more. I got this bird book and here are some food preference of common backyard birds for blue jays 1apples 2 dog biscuits 3 cake, crackers, and cookie crumbs 4 crushed eggshells 5 potatoes,fried, mashed, or, baked.